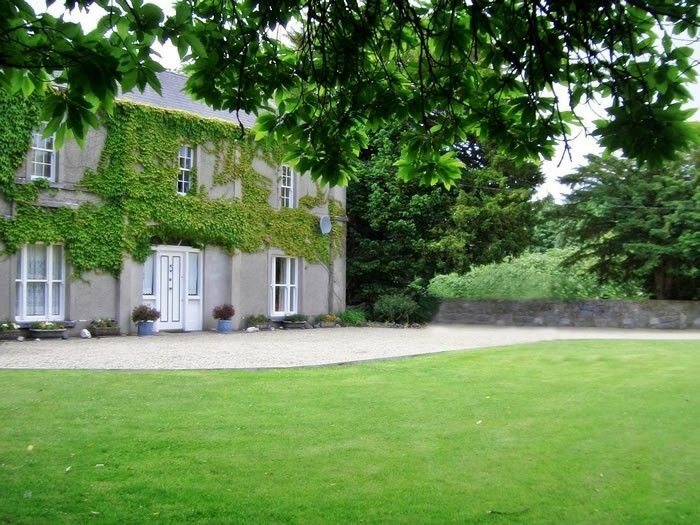 Wellpark is a splendid Georgian (1730), large country house of great character and comfort with Wi-Fi, 6 bedrooms, (sleeps12) for holiday rental in West of Ireland's most beautiful region, Connemara. A superb fishing area. Wellpark is situated in the picturesque village of Oughterard, by the river Owenriff, near Lake Corrib. Oughterard boasts an 18 Hole Golf Course nearby. It lies only 20mins. drive from fascinating Galway, with Theatres, Shopping, Singing Pubs & restaurants. In one acre of lush garden, lawns and orchard, it has its own, separate, specially designed BBQ Garden, a delightful large farmhouse kitchen with open fire, French windows opening onto a Conservatory/SunRoom, aromatic turf fires and winding staircase. A large country house, it lends itself to family gatherings. Built in a more leisurely age, it provides a tranquil haven to refresh body & soul among Ireland's most beautiful lakes, mountains, rivers, candid beaches, fuchsia lined hedgerows and ancient castles. Oughterard Golf Club (18 hole Parkland) 5 min, Dublin Airport 2h 30 mins. Shannon Airport 1hr 45 mins.. Welcome to Wellpark and Ireland: The house offers traditional dining and drawing rooms - 6 bedrooms -3 king size beds,1 queen size and two twins) Huge kitchen with fireplace, table seating 12, utility room, 3 bathrooms (2 showers, 2 tubs) & Italian tiles. Incoming phone - Satellite TV, VCR & stereo and wi-fi internet access. A specially designed barbeque garden, hand made in local stone, with garden table and seating set under the shade of an apple tree & surrounded by fuchsia hedges. Wellpark faces the Owenriff River and is only 5 minutes from Lough Corrib. The region is an anglers paradise, famous for its brown trout, pike and salmon fishing. Boats and local ghillies (guides) may be booked (fish freezer provided). The area has a wealth of beautiful beaches to discover and children ( and adults) can run free and get a real taste of unspoiled nature. Children are very welcome. There is plenty to see and do locally including singing pubs, the Aran Isles, farm parks for children, pony trekking nearby, even dolphin watching, Angling school, Golf courses, castles or a visit to Galway City to visit the theatre, go to the races, or discover the excellent shops with fine porcelain, crystal and hand knit sweaters. Irish Cuisine is wholesome and fresh - try the freshly caught Galway Bay prawns, wild lake salmon or wild blackberry and apple pie & fresh cream.Irsih cheesecake with Baileys cream is a dream..
short stays €450 per night x 3 nights. CHRISTMAS and NEW YEAR weeks are High Season. EXTRA cleaning available @ €50 for 4 hours (paid onsite.) ARRIVAL after 4pm -DEPARTURE by 10.30 a.m. EARLY BOOKING DISCOUNT of 10% on bookings made up to 6 months before Holiday dates. 10% DISCOUNT on RETURNING client bookings. - 10% DISCOUNT on second consecutive week booked (this is not applicable together with Early Booking discounts) . 20% discount on 'Last Minute' bookings, taken within 14 days of the booking period. The property has been in the family since 1730!! & Passed down through generations. We have a large family, so Wellpark is very family friendly and consequently very well equipped to cater for large groups. We all look forward to our annual get together to enjoy the comfort of Wellpark and our various Favourite Trips, the superb countryside, and include delightful Irish Pubs and delicious fresh food in our favourite Restaurants. We are happy to share this information with all our guests. Welcome to Wellpark and Ireland. Wellpark is unique. Built in another age it is oth elegant and comfortable. It will cater for 12 guests comfortably. The dining room can be used for table games or for your wi-fi connection. The sitting room has digital TV with plenty of popular channels and will accommodate more guests. The sun room is a favourite for tea in the garden. There is a place for everyone and the garden is spectacular. Wellpark lies in an acre of mature, well kept gardens with a separate fuchsia hedged garden for barbecues. The large barbecue is hand built in local stone and there is table and seating for all. Try the locally produced lamb chops from Finnerty's, the butcher and their super sausages. Finish off with apple pie & irish Cream, made with apples from the garden! 1 large bathroom with grand corner bath, with hand shower, separate power jet shower enclosure -toilet -bidet and wash basin. All bathrooms are decorated with hand painted Italian tiles and touches of Sanderson. 1 smaller bathroom with bath, bidet, wash basin and toilet. 1 smaller downstairs shower room with shower, bidet -wash basin and toilet. Utility room with washing machine, tumble dryer, iron etc.. and double sink. Large airy kitchen overlooking orchard and opening on to sunroom.. Corner open fire. Seating for 12. Very popular asset! Situated in the kitchen for morning news, music and fun. One acre of beautiful landscaped garden, with flowers, shrubs and ancient trees front and back. A joy! Local hire. Fantastic routes in spectacular countryside. Local 18 hole Oughterad Golf course 5 mins. drive from Wellpark. various other Golf courses east west and Beyond. All in spectacular countryside. Special barbecue garden, set apart from main garden, with large, hand built barbecue in local stone and garden furniture for 12. The barbecue garden is set amongst apple trees and fuchsia hedges. The house is set in one acre of mature lawns, orchard and 1 acre of landscaped garden. (Perfect example of charming, traditional, Georgian house and gardens, built in 1730) New addition - sun room/ conservatory looking onto the lush, emerald green garden, with comfortable armchairs for seating. (Tea in the garden in all weathers) Plenty to do in countryside. local area, Silver mines, fishing, farm visits, music pubs, shopping in Galway etc., etc., Note: internet access 24 hour ADSL WiFi broadband. Telephone incoming calls only. Great house. Large kitchen table for everyone to sit at. short walk into Oughterard. We had a brilliant family reunion in Wellpark House which has great charm and plenty of space. The garden area is lovely, the conservatory and sitting room are comfy and very pleasant, and most importantly, the kitchen table fitted all of us and other family members comfortably. Oughterard was very close and easy to pop in and out of on foot - less than 10 mins. Good restaurants and lovely food shop, O'Sullivans in the town. Plenty of places to see and nice walks nearby. Many thanks for everything. Thankyou Joan for taking the time to write this nice review! Mary, our caretaker wrote that you were all a "lovely group"! Glad you had a good family reunion. Property is beautiful. House has issues because of its age. Great place for a family stay, but we were four couples and the bathroom situation was not ideal. Kitchen was a great gathering place as well as the sun room. The fire in the fireplace was great to welcome us. Oughterard was a 5 minute walk which was great as we had no vehicle. Thank you for taking the time to write a review of Wellpark.. Pleased you enjoyed your stay in Wellpark and Oughterard. Another bathroom is due to be added for next season. "A bit complicated" as the house has its origins in 1730 and is classified "Of Historic Interest" but the feat will be accomplished! Great location for exploring the region. Walking distance to pubs, restaurants and local shops. We were a family group of 10, with three generations. The house is very large so plenty of room for all to enjoy different activities or just to relax in their own way. The garden is beautiful and the apples from the tree were delicious! There are beautiful walks along the river just outside the house, and lots of activities nearby such as cycling, fishing etc. We explored the whole region and the house was perfectly located. The owner provides a great information pack after the booking is made and we followed nearly all of her recommendations! All of the restaurants we visited in Oughterard were of a high quality. The only negative is that the kitchen and bathrooms need upgrading. They are fully functional and the kitchen is well equipped but all are a bit tired. However, this would not prevnt me from booking to stay at Wellpark again. We all really enjoyed our stay. Mary, the caretaker was great. She took action on our concerns immediately. This was our second stay at Wellpark. It’s location is ideal and offers many bedrooms and a large yard for little travelers. The owner had done some improvements and they were lovely. The only issue we had was with the upstairs shower, and Mary had the plumber come right out. However, I think the unit that controls the water needs to be replaced. This property is very close to the village which offers excellent restaurants & pubs. Don’t miss eating at the Greenway Cafe (make reservations!) and Powers has good food and pub fare. There is a nice children’s park at the entrance to Oughterard. There is a new ‘boutique’ grocer, Sullivan’s’ that is a nice addition to the other grocers. Don’t miss popping into Keogh’s for a fine selection of everything Irish to take home with you. All in all, we love Oughterard & staying at Wellpark! I hope we get to return, again. Dear GailThank you dor taking the time to write a review. Glad you enjoyed your stay at Wellpark. Nice to have had you back again.I bave taken note of your bathroom omments a d will have it checked. We had serious structural improvements this year and have renewed all original Georgian panelling. Glad you noticed! Pleased you enjoy Oughterard and the area as much as we do. We rented the Wellpark house in mid July 2018 for our week long stay in Galway. We chose this location for it's proximity to our Irish family and to many of the places we wanted to visit. This is a great old house with all the amenities that a family or families would need for a comfortable stay. There was plenty of room for everyone. The grounds are beautiful and for our family the very large kitchen and sunroom were a plus. When we arrived the caretaker had a turf fire waiting for us. Wonderful. We also hosted our Irish relatives, 25+, for a great reunion. It was a short walk to the village center, shops restaurants and pubs. Also the trails were beautiful and enjoyed each morning. We highly recommend the Wellpark house for your next visit to County Galway and Galway City vicinity. Thank you for taking the time to write about your stay in Wellpark. I' so pleased you enjoyed it as much as we do. It is a special house in a special place which lends itself to a special family holiday. Remember that we give a 10% client discount for any future holidays! A great base for touring Connemara and Mayo or just staying at home and watching kids play in the yard. Thanks for taking the time to review Wellpark! A great help to others making a choice for their family holidays. Glad the kids enjoyed the gardens and you managed to visit Connemara & Mayo! Special places! Dublin is 250 km, a 1h and 50 min. straight drive on the new M6 motorway to Galway (Galway Airport has an airport with flights from the U.K.). Galway is only 20 min. drive to the village of Oughterard and Wellpark House. Shannon Airport. 1hr 45mins. Golf: Situated only 5 minutes drive away from Oughterard Golf Club, 18 hole parkland course with Club house and restaurant, non members welcome. 20 minutes away from Glenlo Abbey Golf Club (18 hole parkland). 15min from Bearna Golf Club (18 hole moorland). 30min from Galway Golf Club (18 hole parkland)and 45min from the spectacular Connemara Golf Club.